Have you ever thought of urban green areas or recreational areas as reservoirs for the components that make up a city’s identity: its most remarkable cultural and ecological values? This is the idea of the emerging ‘national urban park’ concept that has been gaining ground around Finland and around the world from the beginning of the 21st century. A recent discussion has been whether one should be established in Helsinki. But it’s not an easy one. This is because where cultural and natural interests meet, big feelings and pain points are often present. National urban parks make no exception. With this background in mind, the city of Helsinki wanted to create a new kind of process that would bring different stakeholders and park users closer together. We were included in the process as online engagement consultants, which provided us a chance to learn how the strong inclusion of residents can shape the planning of a national urban park. What is a national urban park? There is no solid agreement about the definition of a ‘national urban park’, but there are examples of projects that define themselves as national urban parks or national city parks. Common characteristics for these parks include a central location and the aim to bring up the most remarkable cultural and ecological values of the city. They function much like national parks with goals to preserve the environment and to educate visitors. The difference is that in national urban parks the built environment plays an essential role as well. In many cities the idea of establishing a national urban park originates from the will to protect urban nature from urban development. This was the case also with the world’s first national urban park, the Royal National City Park of Stockholm. The World Wildlife Fund (WWF) of Sweden had a significant role in outlining an idea to join up three separate parks into a bigger “Ekoparken”, which then formed the basis of founding the national city park and giving it legal protection. Following the example of Sweden, nine Finnish cities have established national urban parks. The Finnish national urban park concept is defined by a set of criteria written into the Land Use and Building Act. The legislative frameworks have not, however, removed the original tension between ‘nature’ and ‘town’. The discussion around the establishment of national urban parks often seems to be characterized by a debate between the city’s building pressures and leaving the green network untouched. And on top of the difficult land-use questions within the city, the national urban park status would add regulations governed by the central government into the mix of things local governments need to deal with. This is fruitful soil for heated discussions. The idea of founding a national urban park in Helsinki was brought up to the city council by the citizen group National Urban Park in Helsinki. The idea had been brought up by different actors also before, but in autumn 2017 the city started investigating its potential. This was done in demanding times. Helsinki’s new city plan had earlier marked slices of popular green areas as possible building sites, creating concerns over their fate among citizens. Acknowledging this background, the city wanted to collaborate with the activists of the park group and asked them to join the planning of the participation process. We were hired as consultants to sit down with Helsinki’s planners and the park advocates to facilitate them co-create a map-based survey. It would be used to ask all Helsinkiers what they think Helsinki’s possible national urban park should look like and what it should include. 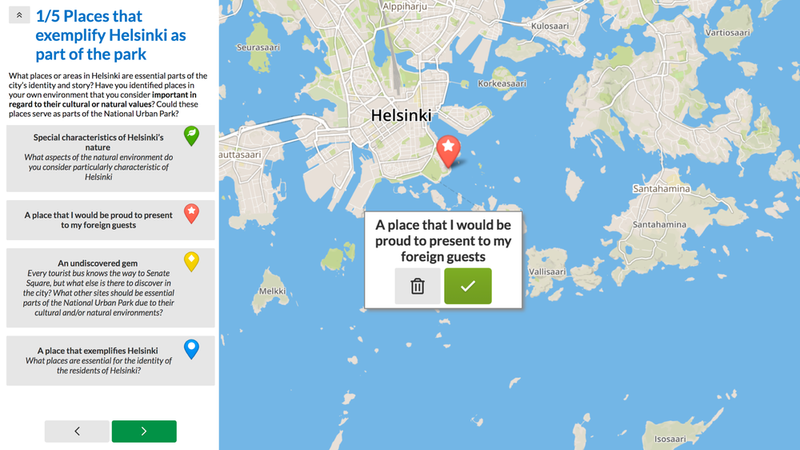 The brainstorming resulted in placing the main focus of the survey in having people map places that they perceive to exemplify Helsinki, where they go to experience nature, and where they perform activities. It was seen important to get this kind of information from citizens because the planners already had a lot of hard data about the remarkable historical and environmental sites in the city. After its launch, more than 1000 respondents made use of the survey to share their insights about how a national urban park should look like in Helsinki. When analyzing the results for the planners, we found that Helsinkiers’ responses, before anything else, pointed to a great love for the sea and urban forests. People also concentrated on identifying places that are special on a specific time of the year: the best spots to observe the stormy sea, autumn colors or the most beautiful spring flowers. In the survey, people had also been asked to draw their favorite routes and to give a rough idea about the possible borders of the park. Especially the latter exercise, we discovered, provided a high-quality data set and it has been useful further down the planning process. 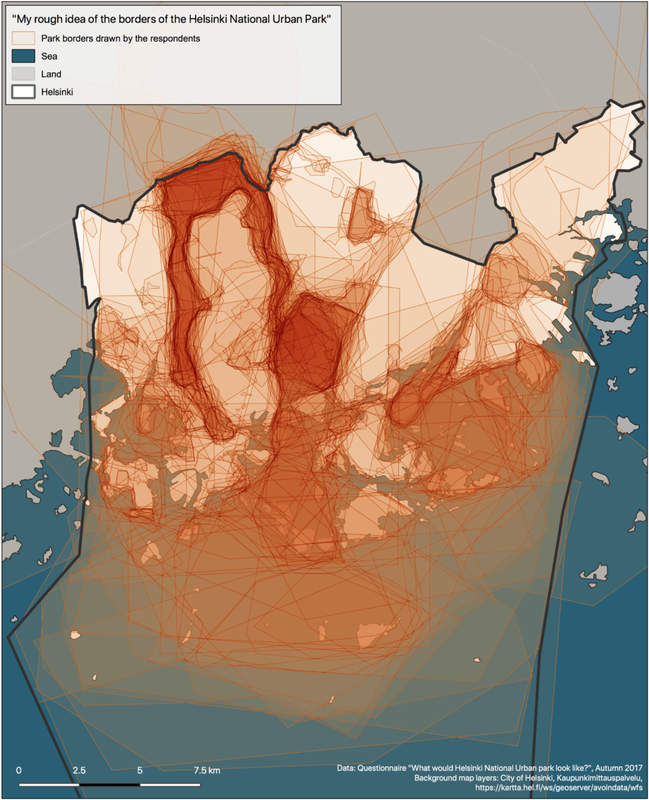 The future borders of Helsinki’s national urban park as perceived by residents. Going through people’s comments, we noted that the tone in the responses was mainly positive, but some people were also a bit worried. The main concern was that should the future park be too small and scattered, its function as a recreational area would be endangered. Most respondents were, however, looking forward to the benefits of getting better signage, unobscured passages in the urban forests, and giving the natural and cultural jewels of Helsinki the glory they deserve. Now that a large crowd has had the opportunity to participate in the project and more trust between the city and concerned residents has been built, could it be possible to define the borders and content for Helsinki’s national urban park that everyone is happy with? As the process continues, we’ll remain curious to follow how the possible national urban park will tell the story of Helsinki.